When Calgon fails you, have you ever tried this? Since it’s been one of those days for me, please share the floor during this week’s Tasty Tuesday. I would LOVE if you could impart some wisdom for those that are searching to make their house a home? So much of what I have learned in my role as a “Domestic Engineer” has come from wise women who have come before me. Surrounding myself with women who encourage me in this role has been a lifeline. I still have many areas with which I am struggling, but I seek out and learn from those more skilled, and then share my strengths with what I know. I love to see that it truly is the “little things that are the big things” in making our house a home. So please tell us one of your best “domestic diva” tips in the comments, and let’s learn from each other. How fun it will be to have a whole section of comments with tried and true nuggets. So what have you been cooking up for Tasty Tuesday? What a moron I am. I was so excited about being first in the Linky that I forgot to leave my tip. My biggest tip is to get the kids involved. Kids as young as 2 (and even younger, depending on the kid) can help around the house. They can set the table, pick up their toys, feed the pets, and lots of other little – but important – jobs. Allowing them to have a productive role in the home gives them significance and makes them feel really valuable. It also means one (or two or three) less things that mom has to do herself. Perfect solution! It must be going around today, I'm feeling a bit challenged too, but more so in the parenting dept. Anyway, my tip for the day is to schedule everything, housework, meals, children's activities, etc. I get so much more done if I have a schedule and do something everyday to keep up with the house. One of the loveliest uncommon thing I have ever heard was not to forget the power of scents. Whether it be a fragrant candle, fresh baked bread or cookies – whatever! Use smell as a way to make your home a lovely retreat for your family and a welcoming haven to your guests. I have a lovely Green Tea scented candle that I adore. And a Cherry Lemonade and a Pear one – those are the three I currently rotate between 🙂 They all add a lovely, light touch and all three have gotten lots of compliments. When I feel overwhelmed, I sit down and make a list of what HAS to get done and what I'd like to get done. Sometimes, if I just do one of the like-to's as well as the have-to's, it makes all of the difference in the world. Also, I am in favor or at least one "mental health" day for Mom a month. It's a day when the kids get their own peanut butter toast for breakfast and dinner is something from either the crockpot or freezer that is already made. I don't clean or worry about the house, I just read or play or shop. Love the picture! I definitely agree that being organized keeps me sane! I love my day planner and menu planning; otherwise, I would be disheveled! Thanks for hosting! So sorry I forgot to change the title from last week. You can delete the sausage stew. My diva tip: Do one load of laundry every morning first thing and it never piles up or hangs over your head all day. My tip is to be easy on yourself. If everything blows up today, there is always tomorrow to get back on schedule. We all have those days but it's okay 🙂 Really, it is! Whether you lose it or not, just get back up and get back to it tomorrow. God's mercies are new every morning. First of all, let me say I love your blog! Something I've found to be very helpful is to clean along as I'm cooking a meal so I'm not stuck with a sink full of pots and pans as well as dishes when we're finished eating. Clean in a circle. I start at the entrance to a room and work my way around to tidy and wipe things clean. (Well when I have my once a year domestic diva day that is :)) This way I know exactly what I am going to do next so it keeps me from being overwhelmed. If I am interrupted I know where to start up again. I like to set the timer for 20 minutes every night and set about the house cleaning and straightening up until it goes off. It's amazing how much I can accomplish in just 20 minutes and it's not overwhelming to me. If you have a family, get everybody involved and you'll have a tidy house. I'm definitely not a domestic diva and I love any tip that I can get to make life easier. One thing that I do that cuts down on bathroom cleaning is to squeegie the shower and dry the walls with a chamois cloth after every use. My tile looks almost brand new, I never ever have a speck of mildew, and I rarely have to scrub any part of the shower except for the tub. Flylady has helped tremendously in helping me keep up with the home. I also enjoy menu planning. The other ladies that posted had some great tips that I use as well. I love having scents around. It makes the home seem more homey (I guess that is what you call it. LOL!) Love all the insight! I've been feeling just like that today. I'm sorry that you had a day like mine, but it's nice to know we were in it together! Looking forward to a better day tomorrow. Great tips here! I try not to get caught up in so much of the "chores" that I neglect what is really important. Sometimes you have to throw down the laundry and smooch on your hubby! My tip would be to relax. No one is perfect. Some just fake it better than others. 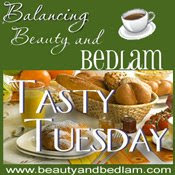 Hi Jen, I'm a newcomer to Tasty Tuesday — I think, anyway! Great idea, and thanks for hosting. My housekeeping is pretty slap-dash, but one trick I use when I am feeling like that woman in the picture on your blog (which would be today, btw!) is to take things in small bites. I have an old wind-up kitchen timer and I set it for 10 or 15 minutes, and tackle a chore for just that amount of time, then set the timer for a break — to read, check the computer, whatever. Hopefully as the time goes on, the "work" times begin to get longer and the "break" ones shorter, but I find I can motivate myself more easily this way. Plus, I make lists. That gives me the illusion of having actually begun some project or chore. Making my house a home has nothing to do with being a Domestic Diva. It's all about the animals! I'm new to Tasty Tuesday. A lot of the other ladies have already shared some of my tips, like making lists, and setting 20 minute timer etc. Hang up or fold and put your clothes away as soon as they come out of the dryer. Then you have fewer wrinkles and therefore less ironing to do. I am not a domestic diva – in fact I would leave the rest of the house to suffer while cooking in the kitchen! And sometimes do…thank goodness my husband has the same quirks as me and understands how I operate. One of my favorite survival tips is to have one place to put all of the bills, write the amount due and due date on the envelope, and pay them every Thursday no matter what. I also go to bed with a clean kitchen and do at least one load of laundry a day – and get that laundry started first thing in the morning. I'd forget otherwise. When working in the house, at any task, I always reward myself with a small thing when I accomplish any task. Such as cleaning up the table in the dining room I have rewarded myself some couch & laptop time. I will sit here for about 5 min or more, but it makes me a bit happier to move onto the next task. Hmm, mental health day…LONG overdue…. Here's my bit of a tip. Since I am home by myself all day, every day (stay at home wife with no kiddo's), housework and getting things done can often take a backseat to the tv. So, I found some great podcasts on homemaking that I listen to on my ipod. I'm encouraged as I'm making my home a better place for my husband and I. I've even put myself on a cleaning schedule and a morning routine that really helps me get things done. I find that if I have my devotional time first thing and talk to the Lord, asking His guidance throughout the day everything just goes better for me…. I don't have any great advice as I am trying to improve myself! I even wrote a post yesterday about how much I struggle with housework! Tip? Don't start canning at 7:30 at night. Ever. MUSIC!! !I made my own playlist on Itunes to get me going on my cleaning day. Also I clean the kitchen as I'm making dinner/lunch…so much easier that way. Clorox Wipes: keep them in the bathroom to wipe down surfaces every night (3 minutes tops), that way if you get any surprise visits your bathroom will look clean. I have to find as many things possible to help us since we both work full time and we have a 17 yr old and 4 month old baby. THANK GOD hubs does the Laundry and he helps out with other house chores. I am finding my 'rhythm' again after being gone for so long. The house looks infintely better. I do have to work on the meal planning. Laundry first thing is a great idea. I like everything picked up when I go to bed, kitchen clean, etc. and I do get annoyed when I come down in the morning and it is a mess. That has gotten better also since my oldest son's poker playing, beer drinking teddy bear moved in with my youngest daughter ;D He seems better behaved. The suggestions here are great. Be sure that you take time for yourself and it is okay not to be perfect. This is our first week of school, so we're getting our schedule back, sort of. Our oldest daughter is a senior this year & a bad start. One of her dearest friends died unexpectedly last Saturday and she's an emotional wreck. We're dealing, but she's staying home this week. I've talked to the school and they are VERY understanding. Another plus for a small charter school. They KNOW the kids individually. I did have plans for this week, but they can wait. The house is reasonably clean (not to my mom's standards, but it never had been ;D), kids are fed and clean and that is what matters. and I am feeling pretty domestically gifted today…got a big closet overhaul done!